Disintegrator for biogas plants :: Cernin s.r.o. 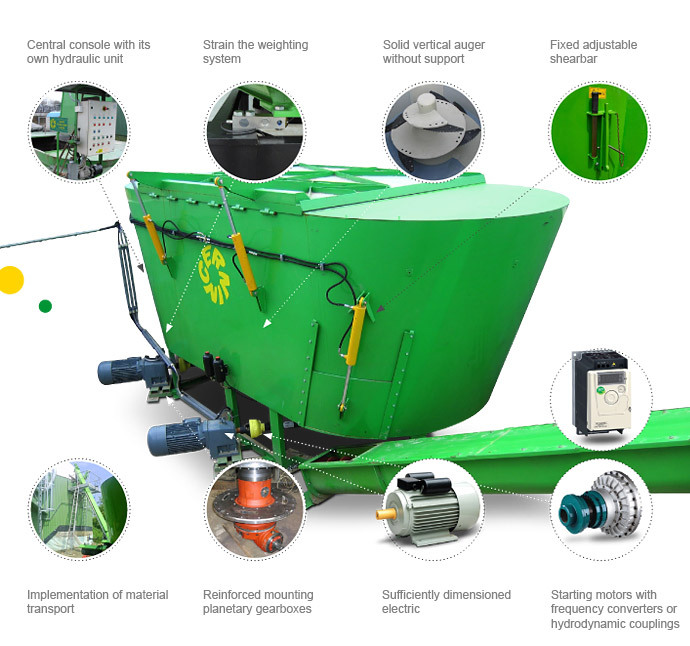 It is an input device for technological lines processing biowaste, communal waste etc. The device is a stationary vessel in the form of inverted, connected truncated cones. The device is provided with one to three vertical conical shaft screws. They are fitted with saber knives. Worms rotate, via helical angular gears, electric motors controlled by frequency converters or hydrodynamic couplings. The device may be equipped with a strain gauge weighing system with data transfer to the PC. The container is closed by a hydraulically operated lid. The removal takes place through an opening located in the shell of the container or, in his bottom. From the pick-up port, the processed material advances by means of screw conveyors to a designated location for further processing. After the material is loaded, the material is immediately disintegrated, cut and mixed. The device is able to process the material even in the form of bales, loose mixtures, branches up to 50 mm diameter, etc. Thanks to the conical stem and optimum climbing of the screws, the material is thoroughly mixed and saber knives ensure high cutting performance. This performance is multiplied by fixed counterparts. Within a few minutes (depending on the material being processed), the mixture is homogeneously stirred and the material is cut to the desired fraction. Do you really want to remove all products from your cart?